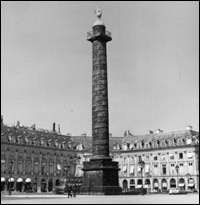 The year was 1950: the city of Paris was experiencing a renaissance in art and ideas. Coco Chanel in fashion, Le Corbusier in architecture, René Lalique in jewelry and Picasso in painting, were all responsible for creating an environment that defined the era. World famous jewelers on the Place Vendôme were inspired by these artists and designed exquisite jewelry for international film stars and European royalty. At No. 20 Place Vendôme, the goldsmiths at the prestigious firm of Guillermin Mollet were working on their interpretation of the times. It was an oversized 18kt gold wristwatch, produced for Patek Philippe. The bold and original design utilized classic art deco styling, while embracing the new ideas of modernism. The result… an original and unique timepiece. The distinctive case was constructed entirely by hand, and was the most complex watch case the firm had produced. Few have ever seen this unique timepiece, as only three are known to exist. Fifty years later, the original design is still a striking example of elegance and style, and has now been faithfully recreated as the Guillermin Mollet Premiere Edition. Today, this exceptional watch is available in a limited edition of 150 pieces each, in 18kt. yellow, rose and white gold. Great care has been taken to maintain the integrity of the original design. Every detail has been faithfully reproduced. The watch, now entirely hand crafted in Switzerland, is fitted with the highest quality automatic movement, a sapphire crystal and a screw secured case back. Each piece is individually numbered. We invite you to discover firsthand the elegance, craftsmanship and beauty that distinguish the Guillermin Mollet watch from all others.